New Kids Camp Offering at Eclectic Institute! 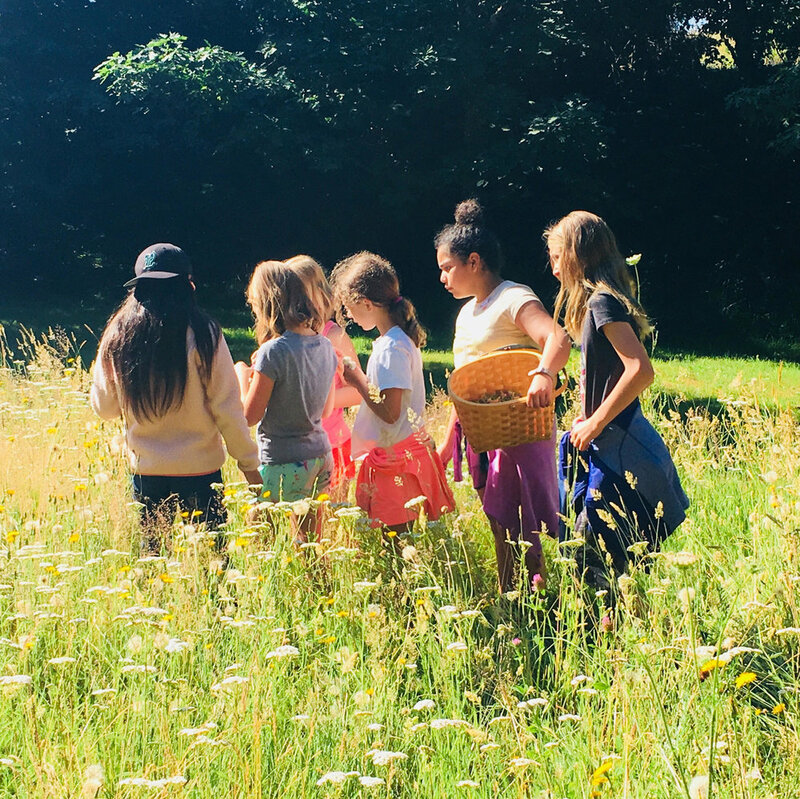 For three consecutive summers, Eclectic has hosted an herb camp for kids ages 8-12 on our 75-acre organic farmland in Sandy, Oregon. 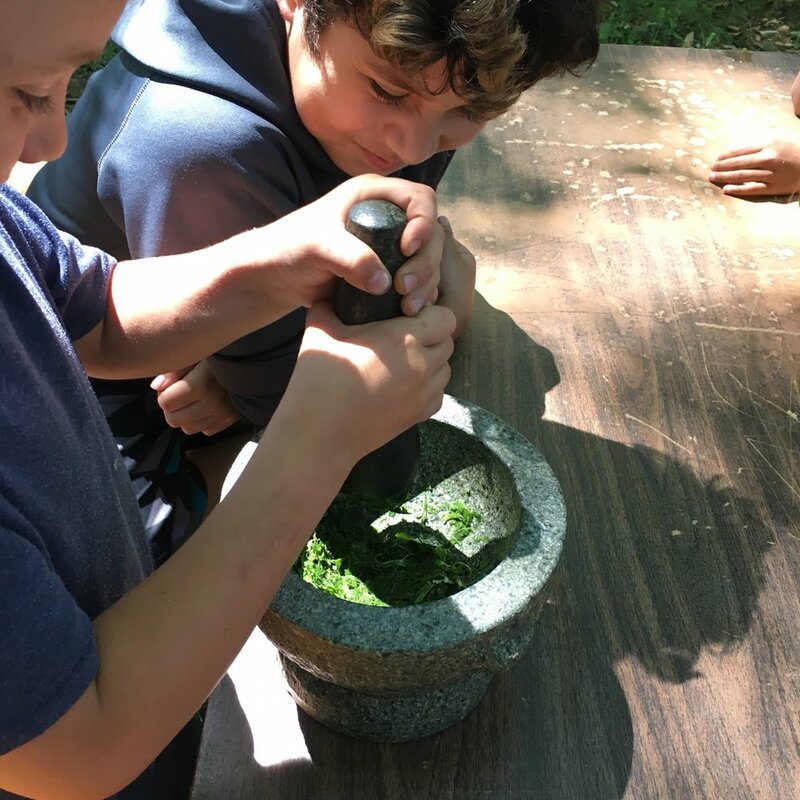 This plant-centered camp gets kids harvesting fresh herbs, learning about their uses, and making crafts and remedies with them. All outdoors, it’s a week dedicated to connecting kids with the natural world through outdoor play and developing an appreciation for plants. This summer, in addition to our annual herb camp, we are excited to offer a new camp: Garden-to-Table Kids Cooking Camp! Less specific to herbs, this camp will be geared for kids who have expressed an interest in cooking. Over the course of five days, kids will harvest fresh fruits and vegetables straight from our organic garden, and will use them to prepare their own morning snacks and lunches. The focus will be on food that is vegetarian, nutrient-dense, delicious, seasonal, and kid-approved! All cooking will be done outside, using hot plates under a shade tent. Kids will learn how to harvest and prepare fresh produce, how to follow a simple recipe, and how to safely handle a knife. And of course, between cooking sessions, there will plenty of opportunity for organized and free play! We think teaching these skills at a young age is of paramount importance for raising healthy kids. Studies have repeatedly shown that when children are engaged in the process of growing or cooking their own food (or better yet, both! ), they are much more likely to be adventurous when it comes to eating vegetables. As we’ve all noticed, simply telling kids to “eat more broccoli” doesn’t seem to do much. But allowing them to participate in the broccoli’s journey from the garden to the kitchen table can make all the difference! Kids are experiential learners. When they can use all their senses to experience vegetables in the garden and the kitchen, impressions form more readily. Kids also have a yearning for empowerment. When we trust them to contribute to family dinner and encourage them to take pride in their work, they’re much more likely to eat what’s being served! 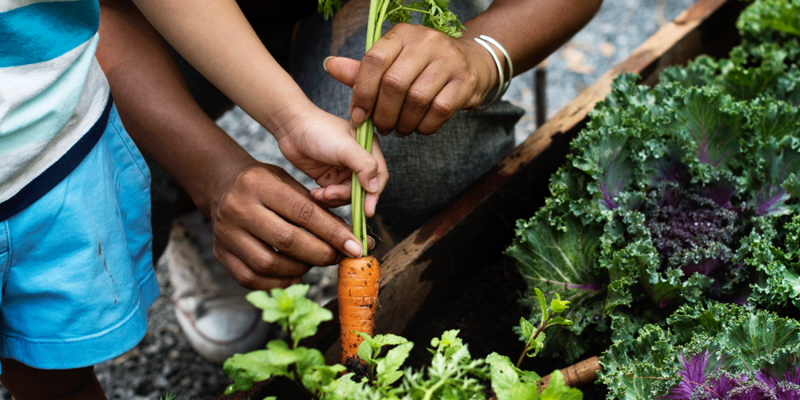 In our Garden-to-Table camp, our aim is to empower every kid to transform fresh produce into healthy snacks and meals. They’ll be shocked and delighted to see how a potato grows in the ground. Then we’ll guide them through the process of harvesting, washing, and cooking with them! We’ll supply simple, easy-to-follow recipes, and also encourage kids to go off script if they want. At the end of the week, kids will go home with their own mini cookbook, and hopefully the desire and confidence to continue making healthy meals for themselves and their families! This year, both camps will be led by Jed Thaggard, LB Gossett, and Chris Alstat. Jed works as Eclectic’s Education Coordinator and was involved in last year’s herb camp. He studied at the National College of Natural Medicine where he earned a Master of Science degree in holistic nutrition. He has worked as a teacher, farmer, and cook prior to joining Eclectic Institute. LB has a background in childhood education, from preschool through high school, in Montessori schools and outdoor camps. Currently she is in training through Trackers Earth to become a forest school teacher, and is excited to bring lots of great nature-based crafts and games to our kids camps. Chris Alstat is a naturopath and the owner of Eclectic, and she started the kids herb camp back in 2016. She has a nine-year-old son and has always enjoyed making herbal crafts and remedies with him. Together, Jed, LB and Chris are looking forward to creating a space to foster a sense of creativity, empowerment, and respect for the natural world. We hope your kids will join us! This year’s Junior Herbalist Camp will run from June 24-28, 9 am - 2 pm. Our Garden-to-Table Cooking Camp will take place August 12-16, 9 am - 2 pm. As a naturopath, businesswoman, and mother, Chris Alstat draws from a variety of experiences to serve in her new role as president of Eclectic Institute. We sat down with her to learn more about her background and her visions for the future of the company. With the holiday season now upon us, many of us are racking our brains to come up with the perfect gifts for our loved ones. If you’re like me, you want your gifts to be somewhat unique, useful, and above all, something that will bring them joy. You know what checks off all of those boxes? Homemade herbal liqueurs! Unless you’ve been living under a rock for the past couple decades, you’ve probably heard that berries are incredible for your health. And what makes them so great is their heavy load of antioxidants. Antioxidants play a crucial role in the body: they donate electrons to stabilize free radicals. Ideally, we want as many free radicals countered by antioxidants as possible. When these two things are out of balance -- specifically, when there are more free radicals than the antioxidants can handle -- the body undergoes what is called oxidative stress, which causes damage to tissues throughout the body. Among the berries, aronia, also known as chokeberries, stand out as antioxidant superstars. They have an ORAC value of 16,062 μ mol TE/100g, higher than that of elderberries, blueberries, blackberries, currants, red raspberries, strawberries, and cranberries. Oh nettles, what would I do without you? You support me through tough times every spring, you make my pestos a little more wild and interesting, and you give my body loads of protein, calcium, iron, and countless other nutrients. In my book, you truly are the hero of spring. Let’s do an exercise. Imagine a salad full of bitter greens: radicchio, endive, dandelion greens, arugula. There’s no dressing on this salad. Now imagine taking a big bite of that salad and beginning to chew. Pay close attention to your tongue. As you chew on those bitter greens, is there a particular part of your tongue that feels more active than others? If you were to actually chew on one of these bitter greens, it might become more obvious that our bitter taste receptors reside on the back of the tongue. And when those become activated, a cascade of physiological responses takes place.